Monsoon Spice | Unveil the Magic of Spices...: A quick peek into Hari Nayak’s “My Indian Kitchen” & a Giveaway! 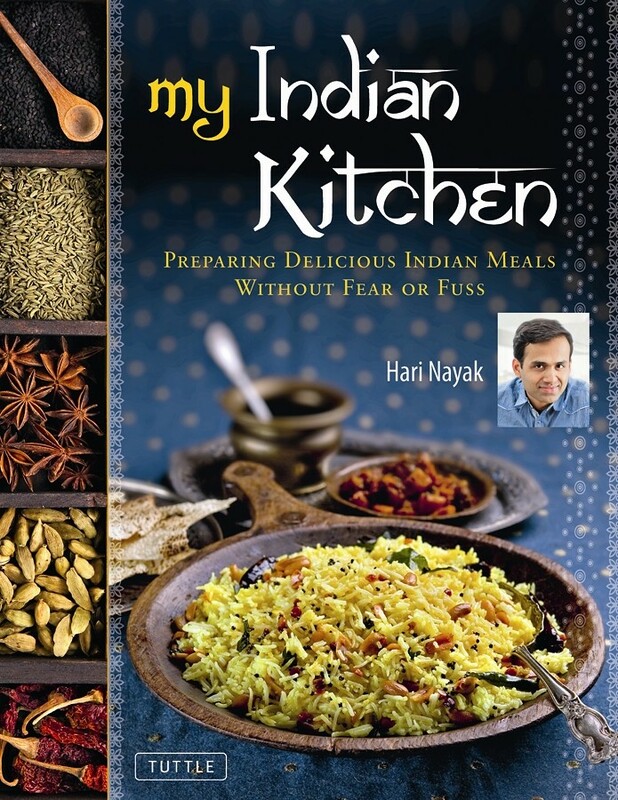 A quick peek into Hari Nayak’s “My Indian Kitchen” & a Giveaway! This is post is long overdue! I have been sitting on this post for awhile now. Not because I wanted to, but because of heavy workload, and some health problems with lil dumpling. But here it is, at last! When I received an email by the publishers of celebrity Indian chef and Restaurateur Hari Nayak’s latest cook book “My Indian Kitchen” to see if I was interested in receiving an advance copy, I readily agreed for two reasons. One, I love to leaf through glossy pages and pour over the beautiful pictures of delicious food! And second reason is Chef Hari Nayak comes from my home town, Udupi-Mangalore, a sleepy coastal town in Southern Indian state of Karnataka. Few months back I was pleasantly surprised when Hari mailed me when he came across my blog and wanted to leave few words of appreciation. So I was obliviously interested in taking a small peek into his kitchen and see how similar or different he cooks traditional recipes. With in few days I received my pre-press release copy to my office address by morning post. It was not easy to concentrate on my work when all I wanted to do was tear open the package and leaf through pages after pages of delicious food captured beautifully and read the recipes. Although I am a sucker for cookbooks and also a hoarder, it’s different thing that I rarely cook from cookbooks! Did I hear few ‘gasps’ and see some ‘shocked’ expressions on some of your face? Well, it’s true! Being a foodie and having food blog doesn’t mean I religiously cook from cookbooks. Instead, cookbooks serve as a source of inspiration as I flip through pages, drooling at exotic food presented beautifully, and imagining how it would actually taste! So for me to cook from any cookbooks, they MUST contain three important things. First, all the ingredients can be easily sourced or available. If not, then the book should contain alternate ingredients that will not compromise on taste. Second, the simplicity of preparation. The recipe shouldn’t be overly complex that it puts you off with lengthy list of ingredients that you never heard of and/or frightening cooking technique. And third and most important thing of all is end result, the very important taste test the recipe and elegant photographs promised! Hari Nayak’s “My Indian Kitchen” promises all three and delivers more! Hari Nayak is part of the creative new generation of chefs from Asia. As a young boy, watching his grandmother grind fresh spices in the traditional stone mortar and hearing the splutter of curry leaves being thrown into hot oil, he knew that being around food was what he wanted to do, always. Nayak is known for his simple approach to food, staying true to the core Indian values of the dishes he creates. His inspiration apart from his village upbringing lies in an ability to absorb influences from other cultures and cuisines that he has experienced in traveling the globe. Since graduating from the Culinary Institute of America, Nayak has worked in the food industry for the past 15 years—including stints at renowned New York restaurants like Aquavit and Daniel. He now runs his own consultancy business called Gourmet Gurus. He has also provided culinary and consulting services to various organizations such as Sodexo USA, ifoodTV, Whole Foods and several restaurants. He pioneeredAmerica’s first ice cream patisserie, Halo Fete, in Princeton, NJ. 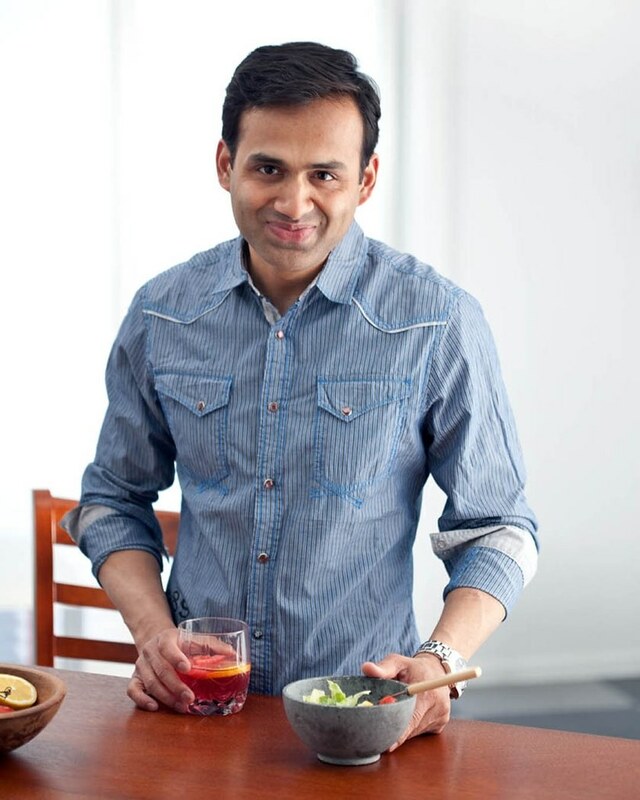 His first cookbook, Modern Indian Cooking, was named "best of the season" for 2007 by the Los Angeles Times. For more information, go to www.harinayak.com. This book contains more than 100 recipes from everyday chutneys to delicious side dish, from aromatic spice mixes to delicious desserts. The book has different chapters on Indian Spice Mix, Chutneys and Dips, Appetisers, Soups & Dals, Vegetable & Cheese Dishes, Seafood, Meat & Poultry, Indian Flat Breads & Rice, and Desserts & Drinks. The book also contains a chapter on “Pairing wines with Indian Food”. Since Hari comes from coastal town, he has penned down some wonderful sea food and also meat dishes for non-vegetarians who look for classic yet modern seafood and meat recipes. While this book contains some elegant restaurant style foods (Kadai Paneer, Rajma Masala, Chicken Tikka Masala, Garlic Naan, Samosas, Mango & Pistachio Kulfi), it doesn’t disappoint people like me who prefer home-styled cooking (Beans Poriyal, Coconut Chutney, Black Eyed Peas Rice, Garlic Pickle, Mangalorean Meen/Fish Curry, Tamarind Rice etc). This book also features recipes that use traditional Indian ingredients but used in western style of cooking (Chai Crème Brule, Pistachio Biscotti, Lamb Burgers, Crispy Masala Fish Fingers etc). The cherry on top is the recipes that use western ingredients which are easily available not just in western countries, but also in India and you had no idea as how to incorporate them in Indian way of cooking (Avocado and toasted Cumin Raita, Salmon cooked with five spices, Broccoli and walnut soup etc). From cooking perfect grains of Basmati Rice to making Indian flat breads, this book has it all! And best of all is the chapter dedicated to ten wonderful Indian Spice Mixes/Powders ranging from very famous and quintessential Garam Masala to Goan Vindaloo Masala! When you finish going through all the recipes you won’t be disappointed by the collection of recipes and the cooking technique. Hari Nayak’s passion for Indian food is very obvious in his “My Indian Kitchen”. “My Indian Kitchen” is for novice/beginners and also for advanced cooks, it is for vegetarians and also non-vegetarians, and mainly, this book is for everyone who loves and wants to try some delicious Indian Food at home without fuss! He not only gives substitutes for the ingredients which may not be available in non-Indian kitchens but also clear cut and precise instructions which is very easy to follow even for the novice cooks and those who are unfamiliar with Indian cooking techniques. This cookbook review is incomplete without mentioning the photographs by Jack Turkel which are visual treats! From exquisite, aromatic spices to inviting, drool-worthy foods, the picture says it all. And the picture of typical Indian vegetable market just took my breath away! With his simple narration, precise ingredient lists, meticulous measurements and clear cooking techniques this book is a keeper and it certainly deserves a special place in your book shelf! Hari Nayak’s “My Indian Kitchen” is for all as its tagline suggests: “Preparing Delicious Indian Meals without Fear or Fuss”. Want to sample some delicious recipes from this cookbook? Then simply go to http://www.myindiankitchen.com/recipe-gallery . You can also order your copy from Monsoon Spice’s Amazon store. Monsoon spice will be completing 5 wonderful years of cooking, clicking, blogging and a beautiful FRIENDSHIP with it’s readers who make it a special place. This is a first giveaway of this month and I have decided to give something that I love! I don't have very large collection of cookbooks as I am very picky about the cookbooks and buy only the best of the kind. For me Hari Nayak’s “My Indian Kitchen” is one of the good books I have come across in recent times and I have decided to choose this one as the first give away for blog anniversary. This giveaway is closed for comments and the winner of the Giveaway is announced here. I would love to have a copy with me though I still live in India. I am an ardent follower of monsoon spice and love going through your simple recipes. Let me be frank I really don't have any favorite cook book. But Mom is my best teacher who helps me over the phone. Hi,,,,,I am happy to participate in this give away...and I loved ur FB page very much.....I love any kind of vegetarian indian food....mostly traditional kind of food...and regarding cook book,,,I hardly use cook book...my cook is my mom.....i learn most of the things from her....but still i like Tarla dalal's any kind of vegetarian cook book,,.. I just checked the book link that you had mentioned and like what I have seen so far. Already following you on both NW sites Sia.Oh I love south Indian food. Big fan of crispy dosa and hot, hot vadas with sambar. A great sounding and looking book! That give away is awesome. I am following Monsoon Spice on Twitter & Facebook. Hii...I would like to participate to win this nice cook-book. I think as a child my first love was Ruchira (introduced by my Marathi neighbour) and lately Sanjeev Kapoor's books. My first favourite cuisine is South Indian but I do love Gujarati, Rajasthani and north Indian food too! Love to participate in this giveaway for I love books, cook books being my favourites(I do unfollow the recipe some time in between)! I love most is Pav Bhajji taste bhi health bhi!! I am following you on Facebook and Twitter(id : spandanab). Hello sia, your review on Hari Nayak's My Indian kitchen sounds very interesting. I would love to get a copy of this cookbook as i not just love to cook Indian food but love discovering new recipes. My favourite Indian food has got to be chaats and favourite cookbook author is Jamie Oliver and Tarla Dalalji. Hey Sia...Heard a lot about this book & its mouthwatering, easy recipes..:) Hmmm....my fav Indian food now is it? It has to be chole bhatura, dosas, mangalorean pathrode, makki di roti & sarson da saag..Well the list can go on but let me stop here..:) My fav cookbook authors would be Asha Khatau, Tarla dalal...But the one very close to me & who has been my inspiration all along would be my mom:) Following u on FB & Twitter..
That's a nice review for a cookbook. Great idea with this giveaway! I am already following your blog on FB. My favorite indian food is definitely samosas dipped in mango chutney! There are so many variations and I just love this combo. My favorite cookbook? That's a tough one...It would probably be Eat, Taste, Heal. Following you on facebook. I don't have a twitter account. I don't have a favorite cook book. I love biryani. How's ur li'll Dumpling? Lotsa love and hugs to him! I have heard great things about this book and would love to have one. Thanks for the giveaway! Thanks for the giveaway Sia !! LOVE LOVE poring over cookbooks :) I have some cook books but I kind of like them all in their different forms. Love South Indian comfort food. My first fav and then Rajasthani and Gujarathi foods. Especially love their Thalis. I ve'nt won ne give aways wud love to win such a lovely book but who knows even if i will be picked by mistake ;) I m not on twitter I m following u in fb from long nd m sure U heard the Mistake thing ;). wow, that book sounds great and looks like has a promise. I already like your FB page, so surely in for the giveaway. Congratulations on ur 5th anniversary.... I liked u on FB and am following u on twitter.....wud love to have that book!!! I already following on facebook, would love to win this book. i am seeing this book being reviewed all over the blogosphere now. i love the cover and the lovely polka dot theme his website has. Read a lot of reviews abt him..:) would love 2 win the cook book..
nice give away..gotte irlilla nammoravru cookbook bardiddare anta. Congratulations on your 5th Blog Anniversary. I'd love to win this Giveaway, and I am a loyal follower and subscriber of your Blog. I love all your vegetarian recipes, and regularly cook your Lemon Rice. Your recipes are easy to make and authentic. When cooking food from the Indian Subcontinent, I consult recipe books by either Madhur Jaffrey or Anjum Anand. I like Kerala recipes with coconut, and Potato Kachoris. I am delighted to see the Giveaway is open to your subscribers worldwide. Thank you! I have been following your blog since three years and your recipes have helped me gain confidence in cooking on my own. I would love to win this cookbook (pick me please;). Nways, being optimistic!! I love traditional Maharashtrian Cuisine including Puran Poli & Bajra Roti with Baingan Bharta. I read some cookbook & follow it only in case I need some kind of twist in the traditional recipe. Anyway; favourite cookbook: Dakshin. Favourite Indian dish I guess would probably by the plain Idli or tarka daal and chapati as I can (and do when in India) eat both of these everyday without getting bored of them. Thats a very nice review Sia... The book sounds to be very interesting .Congrats on completing 5th sucessful year on blog and wish you many more like this. Congrats on 5 years of blogging .. that is quite a milestone and the giveaway is just perfect to the occasion. Looking forward for more recipes . All the best. Congrats on 5years!! I bailed as soon as I got pregnant!! Good on you. Hi Sia..!! I have been following your blog from the time I moved to the US and started to try out new recipes as a beginner 3 yrs ago. I totally love your blog for its simple and tasty vegetarian cooking recipes. I have always had the same problem with cooking books, either I can't find the ingredients handy or the recipe is too complicated. Since you are suggesting this book has all the things I am looking for, i would definitely love to win a copy..!! Thank you so much for your simple yet delicious recipes..!! Hey Sia, I already follow you on facebook and twitter!!! My fav. Indian food is anything South Indian!!! I can survive on Rasam and appalam only!!! I've seen a lot of reviews for this book and would love to try some recipes from this one!! My love for food has made me create a food blog!! :) My favorite food or food area is surely Indian...tho i love all other wonderful regions out there! !....I have always been your follower on facebook! and now I am following you on Twitter too! wonderful book and would love to win it! Sia, I am following you on twitter, would love to win a copy. I love glossy cookbooks and this one is not exception. Nice review Sia and would love to win as giveaway. so glad you have not restricted to just US. :-). I am following you on both facebook and twitter. Hi Sia, I am happy to participate in this giveaway...Congratulations on completing 5 years of cooking and sharing wonderful recipes...Liked you on Facebook...I love good vegetarian food especially Indian khana and with the limited number of cookbooks I have, I often refer to Tarla Dalal's Swadisht Sabzian. That's a nice review for a cookbook. Great idea with this giveaway! I would love to have a copy with me though I live in jeddah. I am an ardent follower of monsoon spice and love going through your simple recipes. To be frank I really don't have any favorite cook book. But Mom is my best teacher. I would like to participate to win this nice cook-book.I love almost all vegetarian Indian cuisine but my favourite is konkani cuisine especially dishes prepared by my mother and i like all vegetarian recipe books. I love Non-veg food specially from Goa.I love fish. The books I love are those of Tarla Dalal and Sanjeev Kapoor. Hi I love Karnataka dishes. I have already liked you on Facebook. I would love to try new dishes, if i win this book. I love south Indian food. This book sounds great! i wish i want to win! Following your page in FB! i love chilly parota and kaima idly which will be served so delicious in Saravana bhavan chennai! i have lot of cookery books by chef Damodharan! hey Sia, Congrats on completing the 5th year, even i love leafing thrghr recipe books and my fav book till now is a hindi cookbook from pustak mahal, tht was my 1st recipe book and have learnt all the basic subzis 4m tht. Oops 4gt to mention tht i follow u on Fb. Monsoon Spice changed my life all in a good way! I still remember few years back when i was newly married, cooking seemed to be a challenge though being a Hotel Mgnt Student.. this website turned me into an ardent food lover since the pictures, the recipes and story following the recipe was there to understand the patterns and texture of the dish. Now this book looks different since I'm so willing to taste the traditional with a twist of creativity! Nope its not about the contest...but definitely...its a beautiful opportunity to reflect my thoughts and feelings about good food! ~ Keep the Spark ALive..
lovely giveaway! I follow you one facebook as my blog page!! And i also follow you on twitter as betit19.. great going Sia! Liking you on FB Would love to have this book added to my collection. ALthough I have never heard of Hari the cookbook seems really intereting and TY for the introduction and nice meeting you as well!! There is a great Indian cook book, it's called "Great Tastes Indian" but I don't remember the author. Love monsoon spice website.. all your recipies and photos are great.. Commenting for the giveaway.. :) Would love to get a copy of the book.. It's indeed nice and generous of you to be hosting this giveaway contest which I would also like to be a part of, if luck permits, otherwise I just want to say I am an ardent lover of Monsoon Spice Recipes and have already tried some recipes to best results! Thanks for this great idea! Happy Anniversary. I liked Monsoon Spice on facebook, and would love to win a copy of this book. Hi Sia!!! i love indian food especially managalorean cuisine!!! Nowadays i follow the recipes from the indian food blogs!! Heard great reviews about the book. Would love to have a copy! I am your follower in twitter too!! Already following Monsoon Spice on FB !!! @Hema, Congratulations Hema! I hope u enjoy reading and cooking from this wonderful cookbook:) Please email me your contact info ASAP.